Afghan President Ashraf Ghani has sworn in 16 new ministers - nearly completing his cabinet after months of delay. All of those who have been sworn in at a ceremony in Kabul are new faces. For the first time four of them are women. But the crucial post of the defence minister remains empty because of disagreements in the unity government. Forming a cabinet has been problematic because Mr Ghani's opponent in last year's elections, Abdullah Abdullah, holds the position of chief executive. Afghanistan now has 24 out of 25 posts filled in its cabinet, and so after nearly seven months of political wrangling finally has a fully-fledged government in place, says the BBC's Shahzeb Jillani in Kabul. Many are young, educated and come from professional backgrounds. For the first time, the 24-member cabinet includes four women. It's all in line with President Ghani's promise to allow technocrats to run the government, instead of warlords and former fighters. But the new cabinet faces daunting challenges ahead. Afghanistan's economy is in a shambles. And, with the emergence of the militant group Islamic State in parts of the country along with the Taliban's refusal of peace talks, security fears are growing. The four female ministers are reported to be Farida Momand at the Higher Education Ministry, Nasreen Oryakhil at the country's Labour Ministry, Dilbar Nazari at the Women's Affairs Ministry and Salamat Azimi at the Counter-Narcotics Ministry. 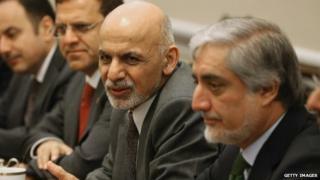 Mr Ghani attempted to unveil his cabinet in January but ran into a number of problems. But the biggest issue has been the question of dual nationality - parliament refused to ratify a number of the president's nominees because they held dual citizenship. The Afghan constitution does not explicitly bar such candidates, but it also grants parliament the authority to either approve or reject nominees with dual citizenship.